The official ruling was a triple with an error by left fielder Charlie Blackmon, but, when it comes to a trot this fast, that’s not going to stop the Tater Trot Tracker. 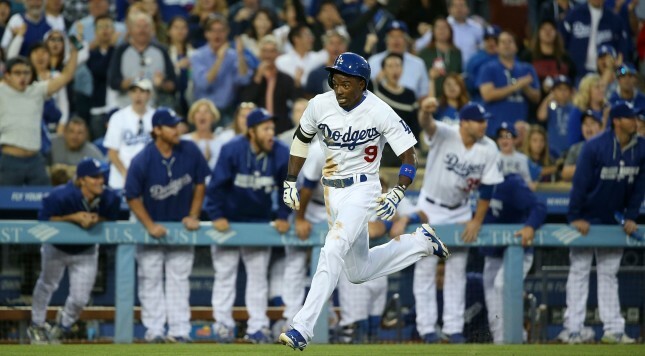 The word around the league has always been that Dodgers second-baseman Dee Gordon was one of the fastest players in baseball, but it wasn’t until his shot down the third-base line Monday night rattled around the corner in Dodger Stadium that we finally got to see what that meant. Running hard from the moment bat touched ball, Gordon’s little league home run clocked in at 13.89 seconds. That is the single-fastest “trot” in the major leagues since the start of the Tater Trot Tracker era in 2010. The previous record was held by then-Angel Peter Bourjos, whose “four-base single” was clocked at 14.02 seconds. The single fastest trot on record still belongs to an inside-the-park home run from Billy Hamilton hit while he was at Double-A Pensacola, which took a staggering 13.8 seconds to complete.